"This is a painter's picture, to which any one of a half dozen titles might be tacked, from the somewhat worn "Dolce far Niente" upwards. 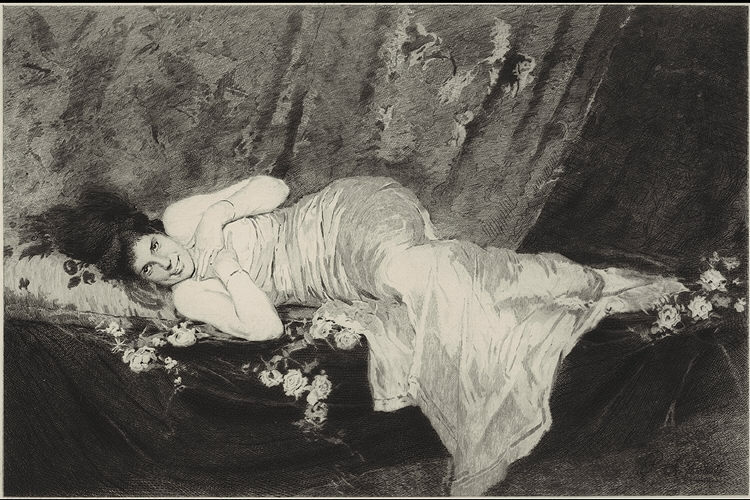 The artist has simply posed his model, this dark-haired, smiling Italian beauty, in a convenient dishabille, in a picturesque attitude, with an appropriate arrangement of flowers, draperies, etc., and painted her as a very superior article of studio bric-a-brac. The title of this no-subject comes afterwards, and can be most anything you please. The justification of the work lies, of course, in the artistic rendering of an excellent bit of color and texture, and the etcher gives us his word, in this very good translation, that the painter has done justice to his theme.